The Volvo 1800ES was a somewhat limited shooting brake version of the Volvo 1800 coupe and it continues to be a favorite for its combination of cheap and cool even if it is covered in a psychedelic paint job or zebra stripes. 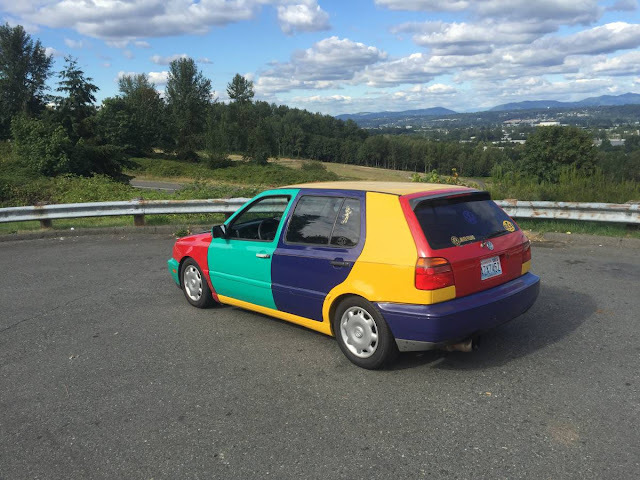 This one is a blank canvas for your creative urges and is offered for a great price. 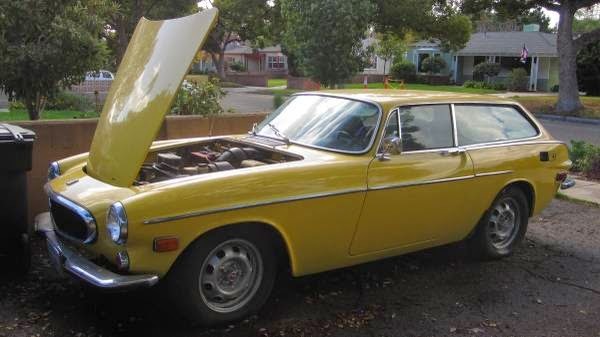 Find this 1972 Volvo 1800ES offered for $5,500 in Burbank, CA here on craigslist. Volvo's 1800ES is a somewhat rare model, only sold in 1972 & '73 model years as a way to extend the life of the long-in-the-tooth 1800 coupe (originally known as the P1800, released in 1962). The funky looks can be polarizing - the Germans call this model Schneewittchensarg, which translates literally to "Snow White's coffin." Power comes from a 112 hp (and 115 lb-ft of torque) B20 pushrod 4-cylinder. This little tractor engine is equipped with Bosch D-Jet electronic fuel injection system from the factory, but this one has been converted to a single Weber carburetor. I am admittedly obsessed with odd engine swaps, but every time I see one of these things I wonder how hard it would be to swap a modern Volvo or anything else engine into one of these. That one MGB with the Toyota engine has left me with a permanent desire for sensible engine swaps that make attractive daily drivers and I think this fellow would be an outstanding candidate. Small block Ford is an easy and common swap, and since Ford owned them it is not a stretch.. It does not look too easy unless you move it forward with a custom pan. But that would negatively impact handling. I have an 1800ES. I have measured many swaps. I really good swap (and low cost) would be the Ford 3.7 V6 available in all secretary model Mustangs. The pan would fit perfect over the cross-member and six cylinders reduces the length. The engine is lighter than the original and puts out 310hp stock. Get the EcoBoost 3.5 and really fly. However, more plumbing would be required. I am considering the new 2015 Mustang I4 2.3 turbo, but I have not measured one yet. My only reservation is if I want to build the car up with the present front suspension. I have purchased a Mustang II conversion front end several years ago and the guy has still not delivered. If he don't come through I may sell the ES. I could do this myself but it would kill me to spend the money twice. Maybe a narrowed Corvette front end? I plan to get it sorted in stock condition to evaluate the handling before selling. I sure like the styling but I like a canyon carver more. I like the 3.7 swap, Rene. I will have to look deeper on the interwebz for more info on it since I haven't seen this particular one closely documented yet. The mustang 2 front suspension and steering was something I have seen and read about before but when I brought this up to the best (only?) classic Volvo shop in Florida they seemed to have never heard of the swap. I am willing to tackle this project myself but I know it's going to take a boatload of time since Damn it, Jim, I'm a doctor not an automotive engineer! That and this would be a learn-as-I-go experience... Any chance I could pick your brain outside this venue?? I paid $3737 in advance to Swedish Ops for a front end kit for my Volvo 1800ES. That was 3 years ago! Robert Jackson (owner) claims he will still come through. I gave him until January 2nd. After that I will start a massive internet campaign to advise other potential customers the status of my order so they do not end up in my situation. If he comes through I could be his best internet customer posting raving reviews. I heard he will be at SEMA. Maybe I need to sent Vito! Naturally the wife is pressuring me to sell the ES since I have not done anything on it in the 3 years while waiting for the front end. We want a new outboard for the boat and she says the money is just sitting there stored in that white ES. I really don't want to sell it but if I don't get the front end I will probably get it running next summer for sale. Rene: there is already a massive internet campaign against this particular vendor! Looks like I am in good company. My financial recovery or front end prospects look bleak. I guess I had better work on a plan "B" or call Vito. That front end body roll on facebook is more than wife's stock Mustang II. Maybe I will play with her car this summer to decide if I make my own Mustang II adapter for my Volvo. There are many sources offering these front ends kits with big ole brakes and tubular arms. Heck, I already have an 8" rear end, dropped spindles, and V8 sway bar/links to install. Gotta sing on the sunny side of the street when your down. Excuse me for a second, Yes Vito that was me that called. I contacted the Robert Jackson fan club. I hope we can prevent other auto enthusiasts from making the same mistake and maybe get the law involved. Looks like the wrong week to quit sniffing glue! I have always like this motor as swap candidate. Did GM have a longitudinal application for the 3800 in Supercharged form? Or could you bolt it up to any GM 5-speed and not have any problems? I love the idea of this swap, but going from transverse to longitudinal (or vice-versa) is almost unheard of in engine swaps. @rene: roger that re your Swedish Ops woes. I ultimately just stopped visiting the Swedespeed forums, I was so disenchanted with the boastful iamtheonlyrealone and his vaporware. His pics show a cool product but I know of exactly zero filled orders as of yet. I am patiently waiting on my 242gt with 16v swap and getting a wee impatient. Like you, I paid for work over a year ago and have heard crickets... Volvolove is a disease, just like human love, alas.